Optimism about Africa needs to be taken in fairly small doses, for things are still exceedingly bleak in much of the continent. Most Africans live on less than two dollars a day. Food production per person has slumped since independence in the 1960s. The average lifespan in some countries is under 50. Drought and famine persist. The climate is worsening, with deforestation and desertification still on the march. Some countries praised for their breakneck economic growth, such as Angola and Equatorial Guinea, are oil-sodden kleptocracies. Some that have begun to get economic development right, such as Rwanda and Ethiopia, have become politically noxious. Congo, now undergoing a shoddy election, still looks barely governable and hideously corrupt. Zimbabwe is a scar on the conscience of the rest of southern Africa. South Africa, which used to be a model for the continent, is tainted with corruption; and within the ruling African National Congress there is talk of nationalising land and mines (seearticle). Yet against that depressingly familiar backdrop, some fundamental numbers are moving in the right direction (see article). Africa now has a fast-growing middle class: according to Standard Bank, around 60m Africans have an income of $3,000 a year, and 100m will in 2015. The rate of foreign investment has soared around tenfold in the past decade. China’s arrival has improved Africa’s infrastructure and boosted its manufacturing sector. Other non-Western countries, from Brazil and Turkey to Malaysia and India, are following its lead. Africa could break into the global market for light manufacturing and services such as call centres. Cross-border commerce, long suppressed by political rivalry, is growing, as tariffs fall and barriers to trade are dismantled. Having a lot of young adults is good for any country if its economy is thriving, but if jobs are in short supply it can lead to frustration and violence. Whether Africa’s demography brings a dividend or disaster is largely up to its governments. Africa still needs deep reform. Governments should make it easier to start businesses and cut some taxes and collect honestly the ones they impose. Land needs to be taken out of communal ownership and title handed over to individual farmers so that they can get credit and expand. And, most of all, politicians need to keep their noses out of the trough and to leave power when their voters tell them to. Western governments should open up to trade rather than just dish out aid. America’s African Growth and Opportunity Act, which lowered tariff barriers for many goods, is a good start, but it needs to be widened and copied by other nations. 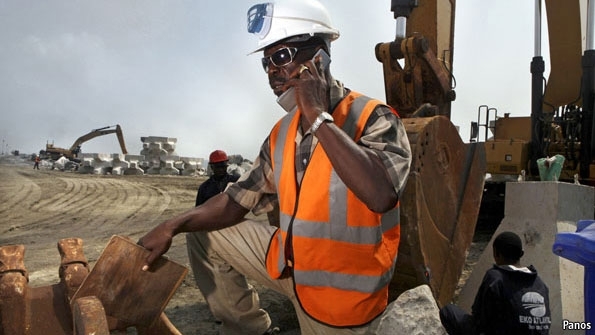 Foreign investors should sign the Extractive Industries Transparency Initiative, which would let Africans see what foreign companies pay for licences to exploit natural resources. African governments should insist on total openness in the deals they strike with foreign companies and governments. Autocracy, corruption and strife will not disappear overnight. But at a dark time for the world economy, Africa’s progress is a reminder of the transformative promise of growth. Correction: It was Standard Bank—not the World Bank as we originally wrote—that provided the statistic that some 60m Africans have an income of $3,000 a year. This was corrected on December 5th 2011. HER $3 billion fortune makes Oprah Winfrey the wealthiest black person in America, a position she has held for years. But she is no longer the richest black person in the world. That honour now goes to Aliko Dangote, the Nigerian cement king. Critics grumble that he is too close to the country’s soiled political class. Nonetheless his $10 billion fortune is money earned, not expropriated. The Dangote Group started as a small trading outfit in 1977. It has become a pan-African conglomerate with interests in sugar and logistics, as well as construction, and it is a real business, not a kleptocratic sham. Legitimately self-made African billionaires are harbingers of hope. Though few in number, they are growing more common. They exemplify how far Africa has come and give reason to believe that its recent high growth rates may continue. The politics of the continent’s Mediterranean shore may have dominated headlines this year, but the new boom south of the Sahara will affect more lives. From Ghana in the west to Mozambique in the south, Africa’s economies are consistently growing faster than those of almost any other region of the world. At least a dozen have expanded by more than 6% a year for six or more years. Ethiopia will grow by 7.5% this year, without a drop of oil to export. Once a byword for famine, it is now the world’s tenth-largest producer of livestock. Nor is its wealth monopolised by a well-connected clique. Embezzlement is still common but income distribution has improved in the past decade. Severe income disparities persist through much of the continent; but a genuine middle class is emerging. According to Standard Bank, which operates throughout Africa, 60m African households have annual incomes greater than $3,000 at market exchange rates. By 2015, that number is expected to reach 100m—almost the same as in India now. These households belong to what might be called the consumer class. In total, 300m Africans earn more than $700 a year. That’s not much, and many of those people could be pushed back into penury by a small change in circumstance. But it can cover a phone and even some school fees. “They are not all middle class by Western standards, but nonetheless represent a vast market,” says Edward George, an economist at Ecobank, another African banking group. As for Africans below the poverty line—the majority of the continent’s billion people—disease and hunger are still a big problem. Out of 1,000 children 118 will die before their fifth birthday. Two decades ago the figure was 165. Such progress towards the Millennium Development Goals, a series of poverty-reduction milestones set by the UN, is slow and uneven. But it is not negligible. And the mood among have-nots is better than at any time since the independence era two generations ago. True, Africans have a remarkable capacity for being upbeat. But it is seems that this time they really do have something to smile about. 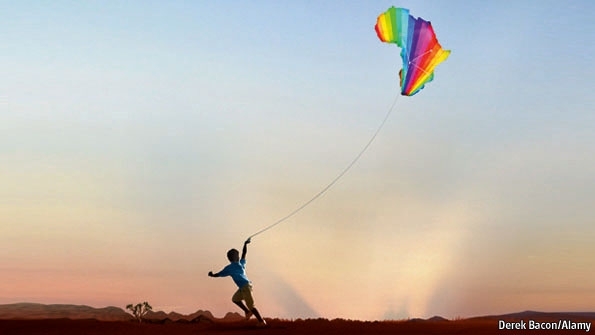 Since The Economist regrettably labelled Africa “the hopeless continent” a decade ago, a profound change has taken hold. Labour productivity has been rising. It is now growing by, on average, 2.7% a year. Trade between Africa and the rest of the world has increased by 200% since 2000. Inflation dropped from 22% in the 1990s to 8% in the past decade. Foreign debts declined by a quarter, budget deficits by two-thirds. In eight of the past ten years, according to the World Bank, sub-Saharan growth has been faster than East Asia’s (though that does include Japan). Even after revising downward its 2012 forecast because of a slowdown in the northern hemisphere, the IMF still expects sub-Saharan Africa’s economies to expand by 5.75% next year. Several big countries are likely to hit growth rates of 10%. The World Bank—not known for boosterism—said in a report this year that “Africa could be on the brink of an economic take-off, much like China was 30 years ago and India 20 years ago,” though its officials think major poverty reduction will require higher growth than today’s—a long-term average of 7% or more. There is another point of comparison with Asia: demography. Africa’s population is set to double, from 1 billion to 2 billion, over the next 40 years. As Africa’s population grows in size, it will also alter in shape. The median age is now 20, compared with 30 in Asia and 40 in Europe. With fertility rates dropping, that median will rise as today’s mass of young people moves into its most productive years. The ratio of people of working age to those younger and older—the dependency ratio—will improve. This “demographic dividend” was crucial to the growth of East Asian economies a generation ago. It offers a huge opportunity to Africa today. Seen through a bullish eye, this reinforces exuberant talk of “lion economies” analogous to the Asian tigers. But there are caveats. For one thing, in Africa, perhaps even more so than in Asia, wildly different realities can exist side by side. Averaging out failed states and phenomenal success stories is of limited value. The experience of the leaders is an unreliable guide to what will become of the laggards. For another, these are early days, and there have been false dawns before. Those of bearish mind will ask whether the lions can match the tigers for stamina. Will Africa continue to rise? Or is this merely a strong upswing in a boom-bust cycle that will inevitably come tumbling back down? Previous African growth spurts undoubtedly owed a lot to commodity prices (see chart 1). After all, Africa has about half the world’s gold reserves and a third of its diamonds, not to mention copper, coltan and all sorts of other minerals and metals. In the 1960s revenues from mining paid for roads, palaces and skyscrapers. When markets slumped in the 1980s the money dried up. The skylines of Johannesburg, Nairobi and Lagos are still littered with high-rise flotsam from the high-water marks of previous booms. Recently revenues from selling oil and metals have helped to fill treasuries, create jobs and feed an appetite for luxury. In gem-rich Angola, high-grade diamonds are reimported after being cut in Europe to adorn the fingers of local minerals magnates and their molls. Overall, though, only about a third of Africa’s recent growth is due to commodities. West and southern Africa are the chief beneficiaries. Equatorial Guinea gets most of its revenues from oil; Zambia gets half its GDP from copper. When commodity prices soften or tumble such countries will undoubtedly suffer. But it is east Africa, with little oil and only a sprinkling of minerals, that boasts the fastest-expanding regional economy on the continent, and there are outposts of similar non-resource-based growth elsewhere, such as Burkina Faso. “Everything is growing, not just commodities,” says Mo Ibrahim, a Sudanese mobile-phone mogul who is arguably Africa’s most successful entrepreneur. A long-term decline in commodity prices would undoubtedly hurt. But commodity-led growth on the continent is not as reversible as it used to be. For one thing, African governments have invested more wisely this time round, notably in infrastructure. In much of the continent roads are still dire. But there are more decent ones than there used to be, and each new length of tarmac will boost the productivity of the people it serves long after the cashflow that paid for it dries up. For another, Africa’s commodities now have a wider range of buyers. A generation ago Brazil, Russia, India and China accounted for just 1% of African trade. Today they make up 20%, and by 2030 the rate is expected to be 50%. If China and India continue to grow Africa probably will too. What’s more, many foreign participants in the African commodity trade have become less short-termist. They are likely to stick around after they finish mining; Chinese workers, of whom there are tens of thousands in Africa, have shown a propensity to morph into local entrepreneurs. A Cantonese construction company in Angola recently set up its own manufacturing arm to produce equipment that is difficult to import. Few Western competitors would do the same (though many of their colonial forebears did). Commodity growth may be more assured than it used to be. But two big drivers of Africa’s growth would still be there even if the continent held not a barrel of oil nor an ounce of gold. One is the application of technology. Mobile phones have penetrated deep into the bush. More than 600m Africans have one; perhaps 10% of those have access to mobile-internet services. The phones make boons like savings accounts and information on crop prices ever more available. Technology is also aiding health care. The World Bank says malaria takes $12 billion out of Africa’s GDP every year. But thanks to more and better bed nets, death rates have fallen by 20%. Foreign investors in countries with high HIV-infection rates complain about expensively trained workers dying in their 30s and 40s, but the incidence of new infection is dropping in much of the continent, and many more people are receiving effective treatment. The second big non-commodity driver is political stability. The Africa of a generation ago was a sad place. The blight of apartheid isolated its largest economy, South Africa. Only seven out of more than 50 countries held frequent elections. America and the Soviet Union conducted proxy wars. Capital was scarce and macroeconomic management erratic. Lives were cut short by bullets and machetes. Africa is still not entirely peaceful and democratic. But it has made huge strides. The dead hand of the Soviet Union is gone; countries such as Mozambique and Ethiopia have given up on Marxism. The dictators, such as Congo’s leopard-skin-fez-wearing Mobutu Sese Seko, that superpowers once propped up have fallen. Civil wars like the one which crippled Angola have mostly ended. Two out of three African countries now hold elections, though they are not always free and fair. Congo held one on November 28th. Even if many of the world’s most inept states can still be found between the Sahara and Kalahari deserts, governance has improved markedly in many places. Regulatory reforms have partially unshackled markets. A string of privatisations (more than 100 in Nigeria alone) has reduced the role of the state in many countries. In Nigeria, Africa’s biggest resource economy, the much-expanded service sector, if taken together with agriculture, now almost matches oil output. Trade barriers have been reduced, at least a bit, and despite the dearth of good roads, regional trade—long an African weakness—is picking up. By some measures, intra-African trade has gone from 6% to 13% of the total volume. Some economists think the post-apartheid reintegration of South Africa on its own has provided an extra 1% in annual GDP growth for the continent, and will continue to do so for some time. It is now the biggest source of foreign investment for other countries south of the Sahara. Somewhat belatedly, Africans are taking an interest in each other. Flight connections are improving, even if an Arab city, Dubai, is still the best hub for African travellers. Blocks of African economies have taken steps towards integration. The East African Community, which launched a common market in 2010, is doing well; the Economic Community of West African States less so. The Southern African Development Community has made the movement of goods and people across borders much easier. That said, barriers remain, and the economy suffers as a result. Africans pay twice as much for washing powder as consumers in Asia, where trade and transport are easier and cheaper. As in Asia a generation ago, relatively small increases in capital can produce large productivity gains. When, after decades of capital starvation, outside investors started to take that disproportionate return seriously, they helped Asia blossom. Now some of those investors are eyeing Africa. In financial centres such as London barely a week goes by without an Africa investor conference. Private-equity firms that a decade ago barely knew sub-Saharan Africa existed raised $1.5 billion for projects on the continent last year. In 2010 total foreign direct investment was more than $55 billion—five times what it was a decade earlier, and much more than Africa receives in aid (see chart 2). Foreign investors are no longer just interested in oil wells and mines. They are moving on to medium-sized bets on consumer goods. The number of projects—for example by retail chains such as Britain’s Marks & Spencer—has doubled in the past three years. Despite the boom in mining, the share of total investment going into extractive activities has shrunk by 13%. That said, the riches are far from evenly spread: three-quarters of all investments are in just ten big countries. The increased interest from outsiders that has been triggered by Africa’s political and technological changes is not, though, the heart of the story. Economic change has made life more rewarding for Africans themselves. They have more opportunities to start businesses and get ahead than they have enjoyed in living memory, and governments are showing some willingness to get out of their way. According to the World Bank’s annual ranking of commercial practices, 36 out of 46 African governments made things easier for business in the past year. That said, most African countries are still clustered near the bottom of the table. In all sorts of ways African governments need to run their countries more efficiently, more accountably and less intrusively. They also need to offer much better schooling, an area in which Africa woefully lags behind Asia. African businessmen constantly complain about the shortage of skills. Hiring qualified staff can be prohibitively expensive. The return of skilled exiles has helped in some newly peaceful countries, but often foreigners are needed, usually other Africans. Without better education, Africa cannot hope to emulate the Asian miracle. Africa’s demographic dividend, too, is far from guaranteed. A growing population and a bulge of working-age citizens proved a blessing in Asia. But population growth always has its costs. All those extra people must be fed, educated and given opportunities. If illiberal policies obstruct growth and discourage firms from hiring, Africa’s extra millions may soon be jobless and disgruntled. Some may even take up arms—a sure recipe for disaster, both human and economic. An abundance of young people is like gearing on a balance sheet: it makes good situations better and bad ones worse. It is worrying that some of Africa’s fastest-growing populations are in economies not performing well at the moment; and fertility rates are not declining as uniformly, or as swiftly, as they did in Asia. Africa’s extra people are flocking to cities. Some 40% of Africans are city dwellers now, up from 30% a generation ago. By 2025 the number is likely to be 50%. In Asia the rate is currently 52%. This is usually a good thing. Productivity is higher in cities. Transport costs are lower and markets are busier when people live close to each other. In bad times, the tight ethnic jumble of the city can be a powder keg. That said, Africa’s worst wars, such as those in Congo, Rwanda, Sudan and Somalia, have been fought in countries where most people are peasants or livestock herders. Extra mouths will need to be fed. There is scope for this. Though Africa is now a net food importer, it has 60% of the world’s uncultivated arable land. It produces less per person now than in 1960. Africa’s land is often hard to farm, with large year on year variations in climate (a problem likely to get worse as the Earth heats up). Farmers lack access to capital for fertiliser and irrigation. More roads and storage depots are also needed; much of the harvest rots before it gets to market. And land ownership often raises thorny issues about who belongs to a place and who does not. Agriculture is a long-term worry. A shorter term concern is how to deal with a coming slowdown and recession in the north. Investors fleeing risky assets in Europe are unlikely to put their cash into Africa. More likely they will pull back some of the money they have already invested there. The signs are that this is already happening. Bankers say the deal flow is slowing. But many remain generally bullish on Africa, convinced that its growth potential will reward patient investors and eventually lure back fickle ones. Africa’s growth is now underpinned by a permanent shift in expectations. In many African countries people have at last started to see themselves as citizens, with the rights that citizenship brings. Greater political awareness makes it harder for incompetent despots to hold on to power, as north Africa has discovered. Bastions of the continent’s past—destitute, violent and isolated—are becoming exceptions. Africa is not the next China. It provides only a tiny fraction of world output—2.5% at purchasing-power parity. It is as yet not even a good bet for retail investors, given the dearth of stockmarkets. Mr Dangote’s $10 billion undeniably makes him a big fish, but the Dangote Group accounts for a quarter of Nigeria’s stockmarket by value: it is a small and rather illiquid pond. Nonetheless, Africa’s boom will continue to benefit Africans, serving the billion as well as the billionaires. That is no small feat.